2. $178,000.00 – This is the cost PER YEAR for RENT for our various locations in order to house all of our dogs comfortably. 3. $500.00 to $700.00 – This is the cost PER DOG to get heartworm treatment. 99% of the dogs we take in have heartworm. 4. $500,000.00 – This is the cost PER YEAR for our vet bill. Yes, you’ve read correctly….that’s half a million dollars. 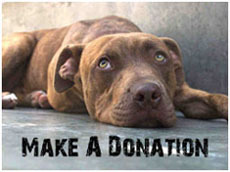 Villalobos Rescue Center is a 501©(3) private, non-profit organization and all donations are 100% tax deductible. Your donations help us to continue to provide our dogs with food, shelter, medical care, spay/neuter, and all of their other needs. Villalobos Rescue Center, Pets in the Hood, Inc. receives no help from the government and relies solely on donor contributions. If you would like to make a donation in memory of a loved one (pet, friend, family) include their name here. If you would like to make a donation in honor of someone’s special event (birthday, wedding, achievement) you can indicate name and brief description here.